2017 has been one of the best years ever in the history of console visual novels in the West. Major VNs including Utawarerumono: Mask of Truth, Chaos;Child and Danganronpa V3: Killing Harmony have all recently received official Western releases on consoles. However, one notable niche that will go under the radar (especially to non-Vita owners) will be the rise of officially localised otome visual novels for the West. For those that don’t know what an otome game is, it is a dating-sim genre where you play as a female character and you can romance one of many male characters. Alongside PC releases like Nightshade and Fashioning Little Miss Lonesome (the first official 18+ otome localisation from one of the major PC VN publishers), there have been a large number of Idea Factory titles (under the Otomate label) releasing outside of Japan, mostly through Aksys Games. Bad Apple Wars is the fourth and last Otomate release for 2017 with more due to come in the future. 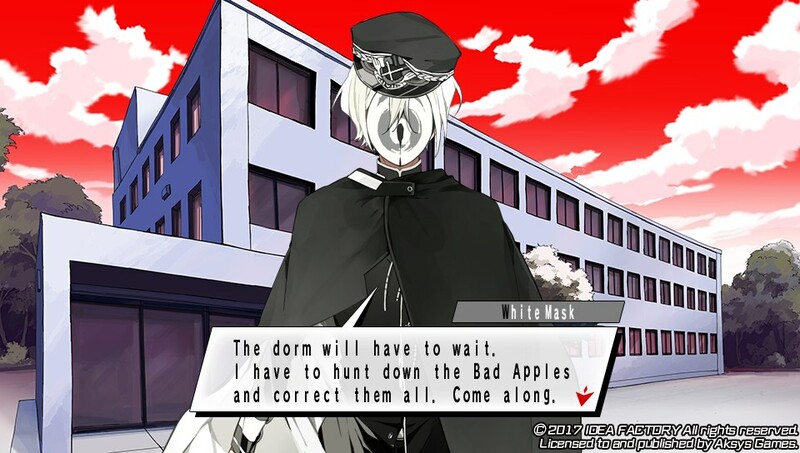 Bad Apple Wars is my first proper foray into the otome genre of visual novels (and no, this doesn’t count), so I’ve taken this as an opportunity to see what the niche of the niche in VNs is all about. The dystopian version of the Easter Bunny will shock everyone. The main heroine (whose default name is Rinka) is caught up in a car crash on her first day of high school and is subsequently killed. She is sent to a mysterious school called NEVEAH Academy, a mysterious place that is somewhere in the afterlife. Once there, she is told that in order for her return to her past life she would need to follow the school rules in order to graduate, hence becoming a “good apple.” The entrance ceremony that follows is interrupted by the “Bad Apples,” a team of delinquents that are rebelling against the school in the hopes that they will get expelled. Rinka is approached by the leader, Alma, and asks her if she wants to live. What is unique about this game’s structure is that you can choose a side when you make your first choice, meaning that certain routes are only unlockable on each side. If you choose the Good Side, you are hired as a member of the Perfects, the discipline committee of NEVEAH Academy. The Perfects “correct” people by hitting them with a weapon – temporarily inflicting the victim with despair. 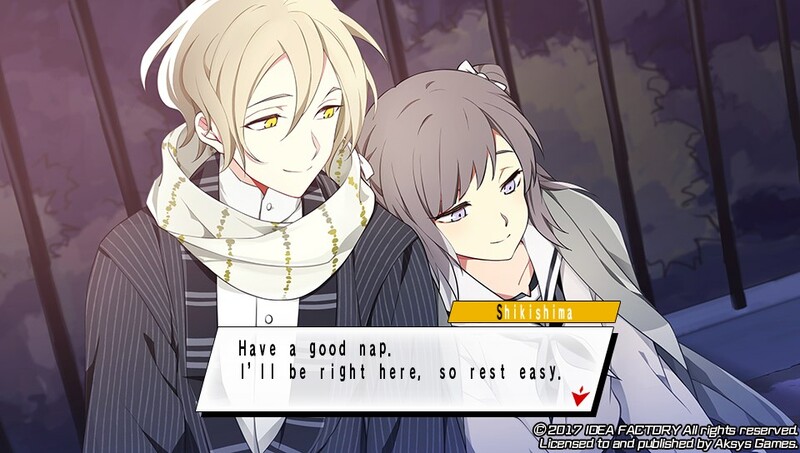 You can romance two characters on this route, Satoru and White Mask. If you choose the Bad Side, you will become a member of the Bad Apples. 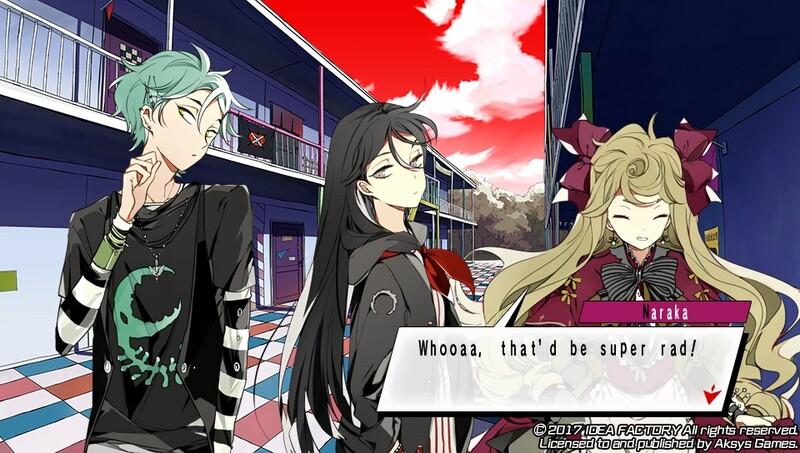 You can romance three characters on this side – Alma, Higa, and Shikishima. There are 10 endings in total comprised of one true ending and one “NEVEAH” (bad) ending per character. Additionally, there is a flowchart system that allows you to see what scenarios you have viewed as well as return to any point in the game to try and unlock certain endings. White Mask is very firm and succinct as part of his mission to correct the Bad Apples. There is also a touchscreen minigame featured in the game. Towards the end of multiple chapters in the game on each route, you have to touch the male character on the touchscreen in particular places in order to trigger an event. Doing so will net you a flashback of the character’s past, adding essential story. In chapters 6 and 7 this minigame plays an important part in determining which ending you will get for that route. As your bond deepens with the character their clothes will be removed in the touchscreen minigame and you will be required to find areas that the character likes and touch them. If you touch the areas that the character likes (this is marked by yellow circles branching out from the point where you touched the screen), this will allow you to continue to the True End. If you mainly touch areas that the character dislikes (marked by blue sparks), then this will lead to the NEVEAH ending. This was fair and balanced for the most part as most endings can be easily determined through trial and error with the exception of White Mask. This was because the two touchscreen segments had touchable areas that were mostly for one particular ending. This originally mislead me into thinking that there was only one ending for White Mask. While this unbalance does have significance to the story, I feel there should have been more balance with regards to what touchable areas unlock one ending versus another. That said, the plot in this game is very interesting. There is a strong emphasis on self-identity and individuality as well as finding a purpose in life. This is important as Rinka finds out that following the rules of NEVEAH makes you gradually begin to lose your identity. The topics discussed are done in a somewhat light manner, presumably, so it could get it’s CERO B rating in Japan. However, don’t let that deter you. This title is a nakige, meaning that any VN (all ages or 18+) in this subgenre will feature plenty of tearjerking scenes throughout the game, even on the common route. The flashbacks play a key role here. Of course, the Bad Apples can fight back. There are a few CGs but none actually show violence. The cast of guys was great, though I found that the Bad Side tended to have better routes. For the good side, Satoru is your antisocial bookworm whom constantly studies. 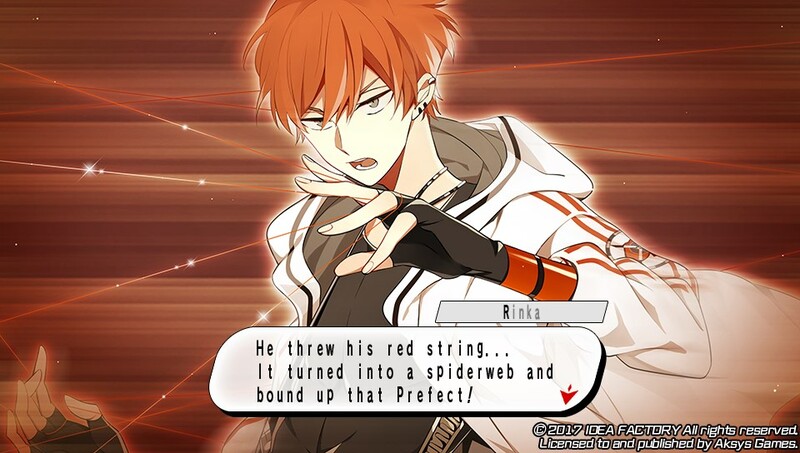 His route wasn’t particularly memorable for me. 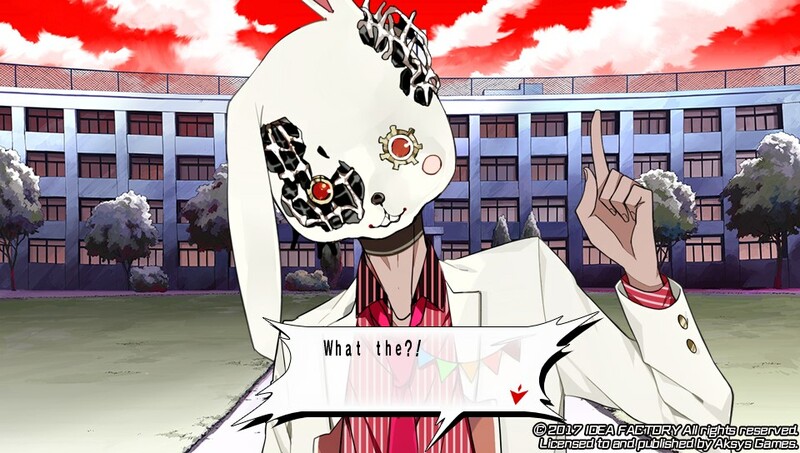 White Mask’s route is one of the more interesting routes especially as he is the head of the Perfects. This means there was lots of potential to tell a unique perspective. In the context of the game’s themes, it excelled, however, this would be hard to explain without spoilers so it’s best that you find out for yourself. For the bad side, Alma is the leader who is relied on by the rest of the Bad Apples. His route gives the most exposition with regards to how the NEVEAH Academy’s mechanics work so this is one I would recommend clearing early in order to get the most background information on the world. Higa is your tsundere character. It was a very unusual experience for me having never experienced a male tsundere before. While initially jarring at first, he became one of my favourite routes. Shikishima is the eccentric loner type who loves to paint. He had my favourite true ending. One thing that all the routes had in common is there was a fair amount of variety in the bad endings even though they are rather abrupt in comparison to the true endings. Of course, it wouldn’t be a dating sim without a kissing CG. I wasn’t the biggest fan of the main heroine’s characterisation. Rinka is portrayed as a girl who is indecisive about what she wants to do in life and what she stands for. Rinka came across to me as very one-dimensional and passive at the beginning and I didn’t like that. This is redeemed towards the end of each route, however, I felt that Rinka should have had more character development at the start, especially as repeat playthroughs meant Rinka’s passiveness became an annoyance to me. After doing some research, I found out this is a typical character archetype of otome visual novel protagonists called “Yamato Nadeshiko.” I haven’t played enough otome to make any meaningful discussion or opinion, however, this is something I think is worth noting to potential consumers so that they are more aware of the cultural context and features present in certain genres of Japanese games so they aren’t surprised. This kind of archetype is similar to how the protagonists in bishoujo visual novels tend not to have any personality or facial features in the CGs. Shikishima might make a good body pillow. Maybe. The localisation was pretty good. Collar x Malice was notable for featuring multiple typos in the English release and although I haven’t played that game yet I would wager that there aren’t as many in Bad Apple Wars as they were fairly infrequent in my playthrough. Furthermore, the font choice in Bad Apple Wars was also criticised as being hard on the eyes by visual novel fans (including myself), however having played the game in action it is something that I got used to over time. However, if the player has impaired sight it may be potentially difficult to read. Continuing on the subject of presentation, Bad Apple Wars’ presentation is very good. The visual art style is distinctive and really helps the game stand out from the usual colour schemes that high school settings in VNs adopt. red sky and the usage of purple were two key artistic choices that greatly helped with this. Character portraits were well drawn and had a variety of poses, however, I do feel a couple of the named Bad Apples should have had portraits too. The music was also of good quality. None of the 18 songs were particularly memorable however they all fit the environments they are used in so they fulfilled their purpose. I guess Naraka approves of the idea of the Bad Apple Wars Day One Edition being GameStop exclusive. To conclude, I enjoyed my 20 or so hours with Bad Apple Wars overall. 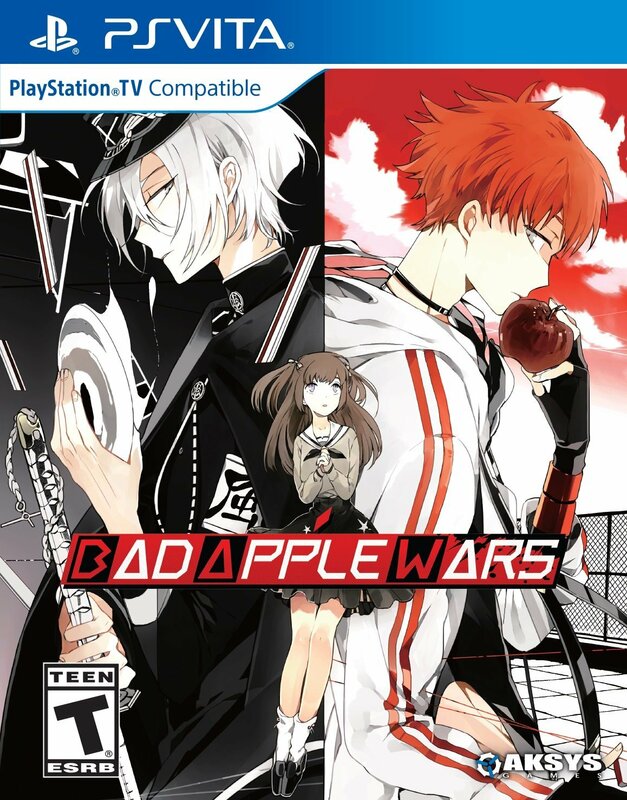 Priced at $39.99 for the digital and standard physical/Day One edition (the latter is exclusive to GameStop), Bad Apple Wars is worth its price tag. This title will likely go under the radar due to the many big releases this year which is a shame as it deserves some time in the spotlight. Additionally, compared to other VNs that have come out this year it is one of the shorter ones so that may be a factor worth considering for potential buyers. On a personal level, Bad Apple Wars piqued my interest in checking out more otome visual novels which is a pleasant outcome.